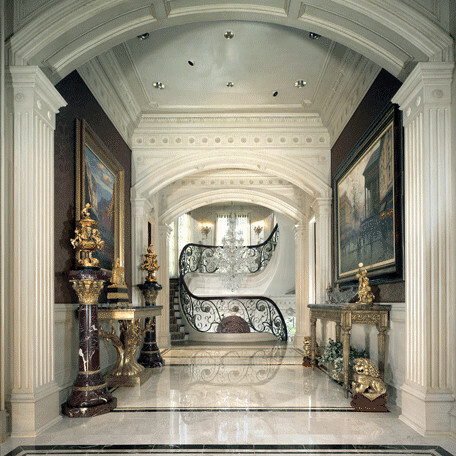 The picture is of a hallway that is in a home that the company built in 2009. The entire home required exquisite and detail design which required the best of workmanship of which the company was very proud to have done. The Texas economy at the beginning of the new decade was doing fairly well with a pickup in the energy related field and services. Labor was tight, but there was some weakness in the manufacturing sector. Unemployment rates were still at all time lows. The energy sector was still growing due to the higher oil and gas prices. Oil rigs in Texas by the 3rd quarter of 2000 was at 364, a 33 percent increase since the beginning of the year. The oil industry during the period had a hard time finding workers because of the tight labor market and there were more opportunities in other sectors of the economy. Construction is another industry that got negatively affected in a tight labor market. The private service, which was growing at an annual rate of 3.6 percent a year, was one of the reasons the construction industry was doing so well. With more jobs created, people migrated from all over the country or outside the country and housing was needed. With the growth in business comes increase in office space, as well as, all other areas of commercial constructions, such as schools, hospitals, churches, warehouses, etc. In year 2001, there was a dramatic downturn in the economy mainly in the manufacturing and high-tech areas. The hardest hit areas were Austin, Dallas/Ft Worth, El Paso, the other metropolitan areas, also felt some of the economic downturn. The main sectors that saw most of the negative growth were in the largest employment areas; services, wholesale and retail, and manufacturing. The slowdown has not caught up yet with the construction, oil (part of the mining industry), finance, insurance, real estate, transportation, communications, and public utilities that comprised the smaller areas of the economy regarding employment. After September 11, everything changed and America was never the same. Even though the economy was seeing a slowdown, the destruction of the twin towers by terrorists, made the recession longer than it typically would have been. The hardest hit industries were the airlines, hotels, retail, transportation and distribution, leisure, and business travel. All these industries resulted in having to implement large layoffs. Drilling permits in Texas dropped 43 percent by the end of September. The private non-residential construction funding saw a steep decline right after the beginning of the first quarter of 2001, while the money spent on residential construction was still increasing. Texas enjoyed great economic expansion for ten years and then ended in 2001, which actually turned negative before September 11, mainly because of the national and Mexican recession. There were signs before September 11 that the recession was to be short lived, but the recovery became bleaker as time passed by. According to the Fed survey, it suggested in 2002, the Texas economy lagged that of the nation mainly due to the dependence on the industries that got badly hurt; transportation (because of 9-11), high-tech (telecom), and energy (weak oil and gas prices). Manufacturing and mining had been the hardest hit followed by transportation, communication, and public utilities. The high-tech, transportation, and construction were hit the worst. These were some very hard times for the construction industry. The Texas rig count declined by 26 percent and the oil and gas employment dropped 3.2 percent. Oil prices maintained a $27 level for the first three quarters of 2001, but then oil went to $19 a barrel before coming back to the $30 level in the first quarter of 2002 because of what was going on in Iraq. Overall construction and real estate took a real beating in 2002. The commercial side of real estate construction remained very weak with office vacancy rates hovering 25 percent in Austin, 26 percent in Dallas and 16 percent in Houston, which was to reach the mid 20’s within a year. With the effects felt from 9-11 and the higher vacancy rates, commercial real estate insurance premiums increased 50 percent. Definitely not helping matters for non-residential real estate dilemma. Even though the commercial real estate took a hit, residential real estate, especially that of around $150,000 or less remained strong. This occurred due to a lending freeze that was spurred by events that gave financial institutions a large pool of available funds. Throughout most of 2003, the Texas economy seemed to be growing, but mainly stable or flat, depending what industry it was. The unemployment rate was still higher than the rest of the nation at 6.5 percent, compared to the national average of 5.9 percent. In 2004, economic recovery grew only slightly, suggesting a steady recovery, but the unemployment rate was still higher than the rest of the country. Any employment gain was reflected in the education, health services, trade, transportation, and utilities. Two thousand five was the year of Katrina and Rita, which agitated economic activity even more and life as it was, but aside from the disruptive events, the Texas economy was strengthening. The construction activity had also picked up during the year, boosted by the building of residential homes and apartments. Two thousand six turned out to be a great year, with growth at about twice that of the rest of the country at a 3.2 percent annual rate. The unemployment rate dropped to 4.8 percent. Helping the job growth rate was due to the strength of the Texas exports. The strength of exports was mainly from the energy sector, with increase shipments of chemicals, oil, and gas extraction equipment. The construction industry was as impressive as the rest of the country and residential contract values reached record levels and outperforming the rest of the country. In 2005 and 2006, the state’s residential contract values increased from 8 to 10 percent of the total residential contract value. Starting 2007, residential builders were seeing a surplus of homes and needed to slow down. The Texas economy had weakened towards the end of 2007 with manufacturing and construction being the weakest sectors, Residential builders reigned back leading to a fall in single-family permits. New home inventories were taking longer to sell ranging from 6.1 to 7.6 months. The delinquency rate of sub-prime mortgages began to rise, higher than the national average. Demand for multi-family construction was on the rise because of the tighter credit requirements. People tend to rent when they feel uncertainty in the future of the economy. Overall, employment statistics revealed a weaker economy, but stronger than the nation overall. Texas continued to do well as the rest of the nation fell into a recession in December 2007, but in 2008 Texas felt the same fate. The Beige book, the Dallas Fed’s report on regional economic conditions showed a broad and deep deterioration by November of 2008. The Texas manufacturing outlook showed a sharp decline in production, shipment, new orders, and capacity utilization. Texas’ efforts declined due to rising value of the dollar and faltering economy overall. Texas’ housing market continued to erode and remain weak for some time. Many businesses said that the tightening credit market was affecting their business. Without the flow of funds into the market, you cannot have a growing economy, but a contracting one. Energy prices had been going south, the financial sector has been shrinking, and troubled back loans have been plaguing the banks. Texas will likely continue to outperform the rest of the nation mainly because its housing sector fared better than most states, cost of living and doing business is lower, and the energy sector continues to play an important part of the state’s economy. If oil and natural gas prices decline further, that relative strength could decline. Even with a recession in 2008, Texas seen a foreign-born population increase of 58,320, according to date from the US Census Bureau American Community Survey. The economic slump has seen a dramatic decrease in foreign labor. While the recession hit all states, Texas fared better than most states. Employment in Texas actually edged up and construction only fell by 1.8 percent. The commercial real estate construction in Texas steadily worsened starting 2009. During the third quarter vacancy rate in commercial real estate hit 22.7 percent in Dallas and 15.3 percent in Houston. August 2009 investment activity in commercial real estate in completed sales was down 80 percent from the prior year. The number of distressed properties that are in bankruptcy, restructure, or foreclosures is rising. The financing of new properties remains very tight all over. In Texas, September 2009 contract values for retail, warehouse, and office projects fell 71 percent over last year. The labor market however seems to displaying a better picture with employment losses subsiding. Job growth averaged about zero the last three months of 2009 and during the first quarter of 2010, it turned positive. The decade of 2000 started with a recession and ended with one, as well. The 2008-09 recession has been the longest of any of the previous 10 recessions. The previous 10 recessions ranged from 6 to 16 months and the current one has been already longer and has not yet been determined of length by the Business Cycle Dating Committee. Texas lost 338,600 jobs in 2009 and the unemployment rate rose to its highest level in 22 years. Although, the decade ended in a miserable economic condition, there is recent evidence that suggests the states troubles may be ending. According to the Dallas Fed’s Beige Book, a survey of current economic conditions indicates that employers are finished with cutting jobs and staffing firms are noting an increase in temporary hiring. This is a favorable indicator because it leads job growth by an average of five months. Thies, Jackson, (2009). The Southwest Economy, COMMERCIAL REAL ESTATE: Recession Takes Toll, Banks Put at Risk, The Federal Reserve Bank of Dallas.